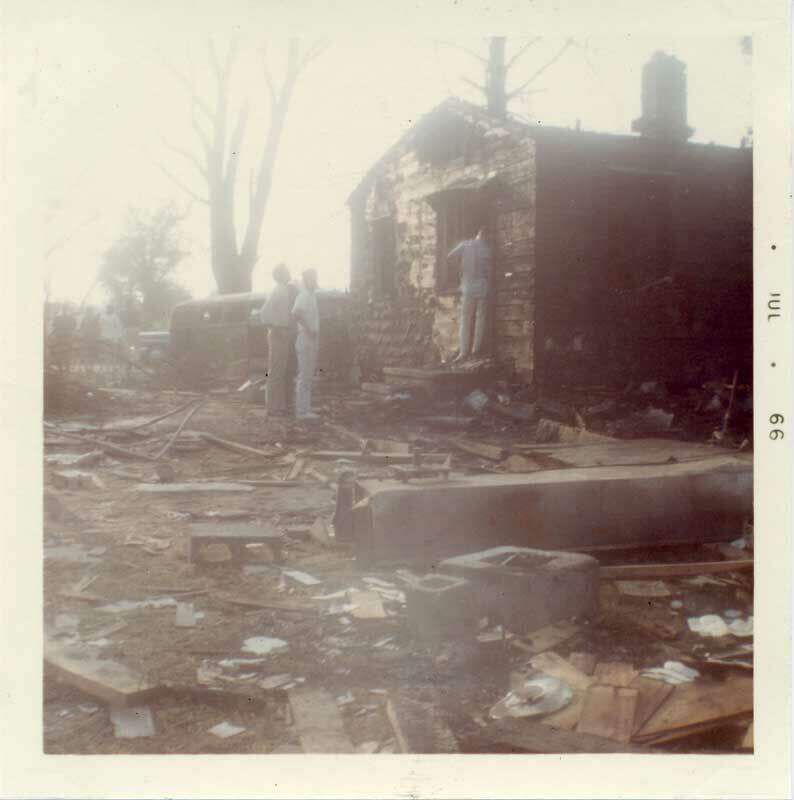 There has been something on my mind that seems like it never happened -- primarily because there is nothing about it on the internet, plus practically no one I've talked to seems to remember -- and that is the 1966 jet crash in Buckroe. Just wondered if anyone has a "where were you" story regarding this. I remember romping around in our living room on Chesapeake Avenue in Hampton that night, and hearing an eerie "WHOOMPHH!!" as the house shook a little. of enjoying this event, thinking about how creepy that plane crash was. as we continue this dialogue. Having a very close date will help in the search process. It took us nearly four years to solve the last such mystery; perhaps this one may be uncovered sooner! standing on the river's bank and saw the plane disintegrate in mid-air. various models of cars and planes) and it was not one of the Blue Angels. the visual sequence, but it likely started with the engine blowing up. completely stunned and saddened by it all. boat crash rescue vehicle that could go 60MPH in 6 inches of water. I recall being on my Third Class Midshipman cruise in the Pacific when I heard of the crash. For some reason I have always thought it was an F-4 Phantom, but I cannot corroborate that. 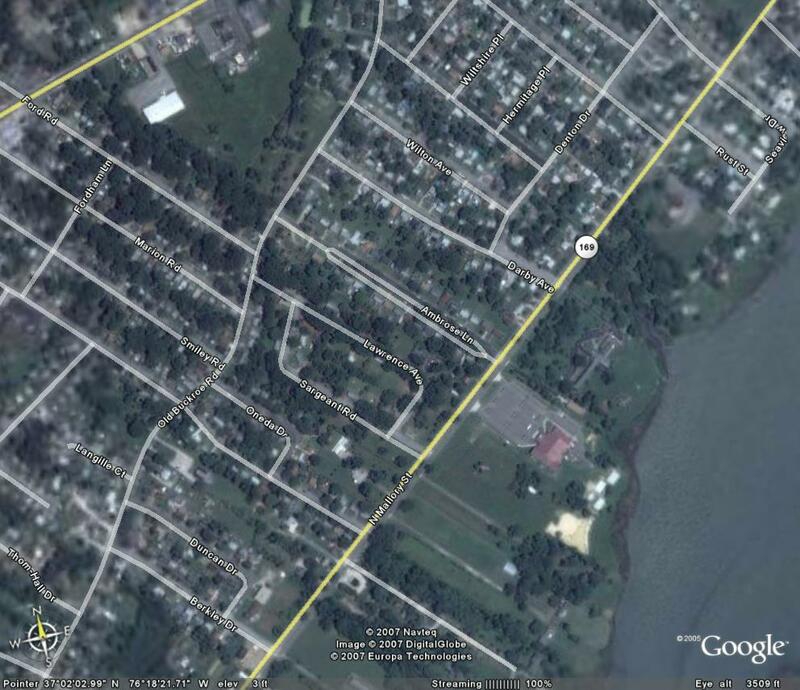 When I returned to NN from that cruise, I think "the guys" told me that the crash site was a residential area on the north side of Pembroke Avenue in the vicinity of the old WVEC studios, which were on the south side of Pembroke, but give you a sense of the area. That is close enough to Buckroe that I can see why the news would call it a crash in Buckroe. bombers which collided in midair, comes down in Hampton, Virginia. 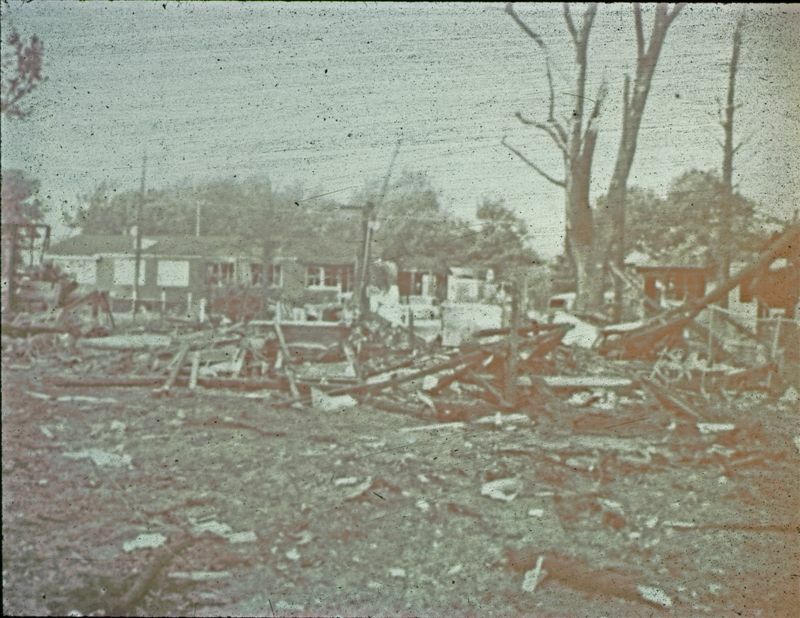 10 homes were leveled. The four Marine crewmen bail out safely. David, you are a super sleuth! Thank you so much! for June and July 1966. I expect that it made the front page. Well, of course! Thanks, Dave! ZOWIE! The Buckroe jet crash didn't remain a mystery very long, did it?!? Makes me feel weird & creepy all over again. a super-sleuth; I myself couldn't find a cotton-pickin' thing about the crash on Google. Thanks, Jean! You're right; David is quite amazing! in the same homes where it happened. It happened in July 1966-- late afternoon. I was in my bedroom fixing my blinds and heard a very loud noise and looked out the window and saw a skinny mushroom type black cloud of smoke rising up from right where my goggie (grandmother) lived. I screamed through the house to my mom and dad and said people are dead, people are dead, we tried to phone goggie, but there was no answer -- I ran out of the house barefoot all the way to her house, and luckily her house had not been hit. When I arrived she was leaning out the door, and all the power lines had been cut. 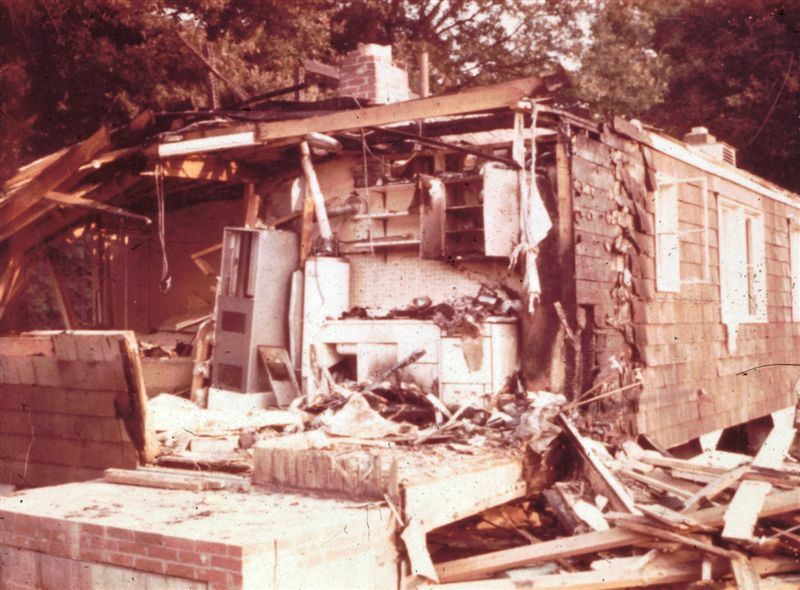 She was okay, however, across the street around the corner a bit, the plane had hit the first house and crossed the street and slid into Mrs. Edwards' kitchen and garage and stopped across Old Buckroe Road into other homes (the ones I used to call matchbox homes because they were square and small and looked like matchboxes) -- the only deaths were a woman and her infant in the first house struck. That was a miracle. My brother (George Mooney, Hampton HS '64) wrote a paper on it for Old Dominion College, but I don't recall if the paper still exists anywhere. Also he might have sent something to the Daily Press. 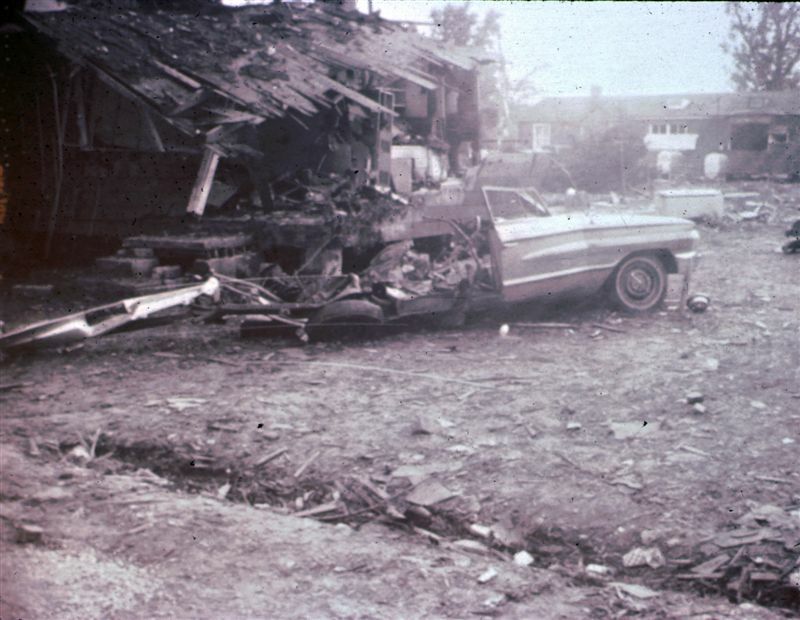 For a long time the rest of that summer of 1966, tons of cars would drive through on Lawrence Avenue (the street where Goggie and Uncle Bill lived) to look at the destruction. 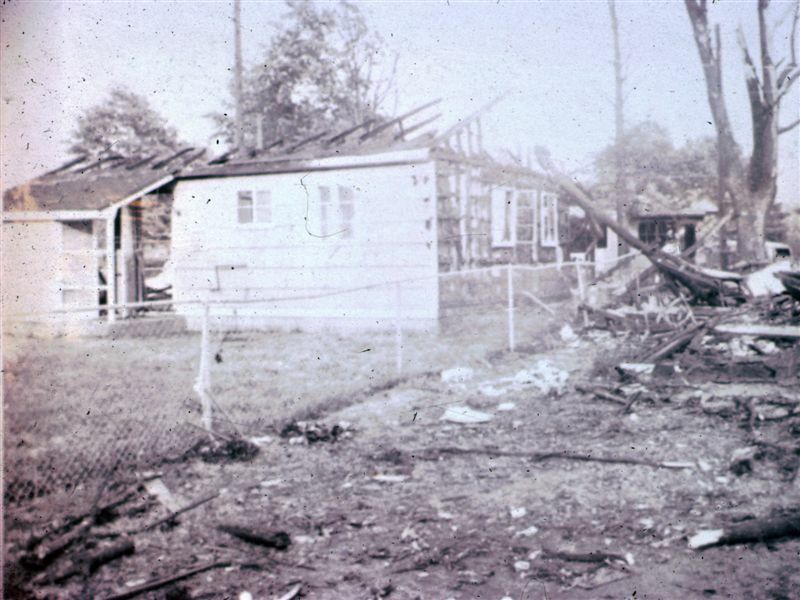 Mrs. Edwards said right before the plane hit across the street, she had been in the kitchen when her daughter phoned her, and Mrs. Edwards walked to the hall to answer it, at which point the plane hit and shirred off her kitchen and into the garage in the back and continued across Old Buckroe Road. Her daughter's phone call saved her life. It was very tragic that the Navy pilot had ejected and let the plane go. about a 1/8 mile and came thru the roof of the bowling lane at Buckroe Shopping Center. 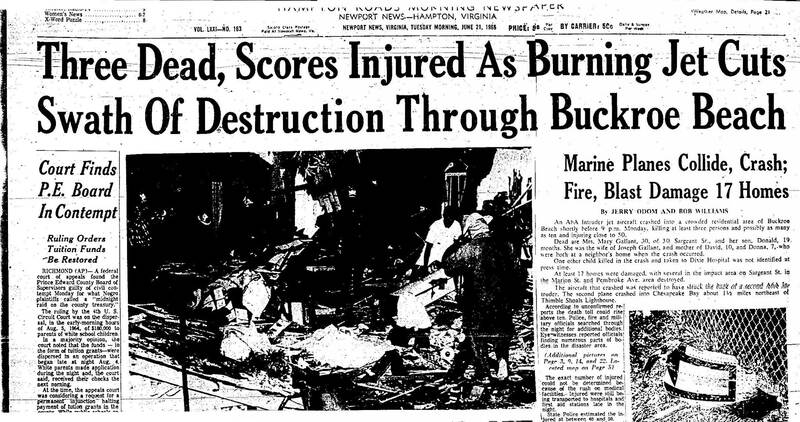 I don't remember the date, but I know it was summer and I think it was 1965.
best to kill us, so I missed the Buckroe Beach jet crash. Thanks, John! Maybe there's another story there in Poquoson for us! was on the phone looking out our kitchen window talking with his mother. He yelled "Look, I just saw two planes collide!" I was home, but did not see it, though I heard the noise. After they let the public view the site, my husband and I went to see the area and took these pictures. 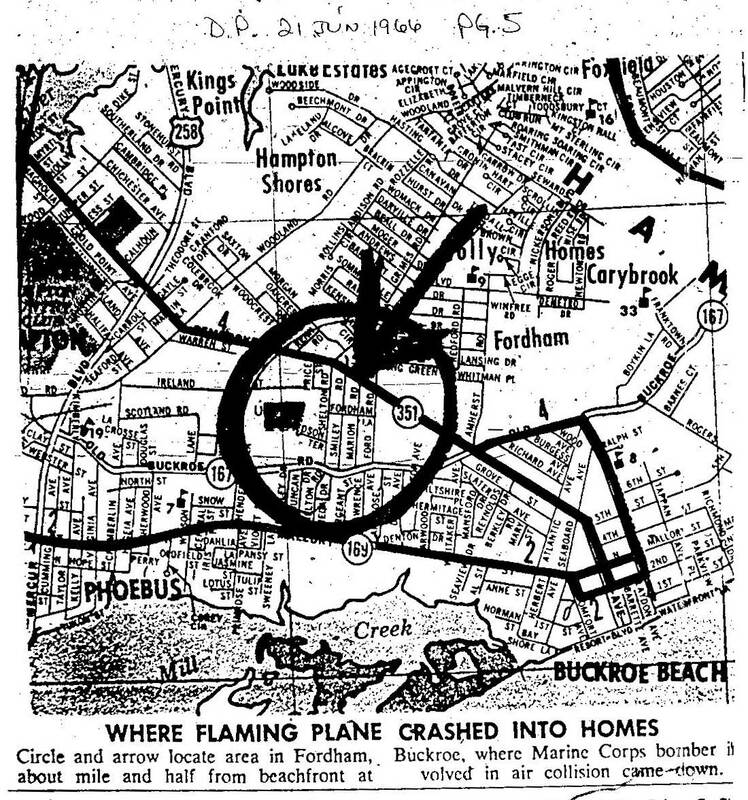 I can't remember what street the plane landed in; maybe some others will have more information. I just returned home from the Hilton Library with copies (20 pages) of all the newspaper reports of the crash over several days. I was hoping to scoop everybody. Still, I will scan and stitch the images together for you. At least you can see how the local media handles such a local disaster. the crash site was " .... Marion St. and Pembroke Ave." That is on the north side of Pembroke. Thank you so much, David! Super Sleuth you are! June 20, 1966 is my wedding day. when I finally got to talk to my mom. So as you can see it was a night I will never forget. For more reasons than one. WOWZERONI-RINI!! I'm stunned! Thanks so much, Jerry! Carol ... sounds like you have all the details! directions. We asked what had happened and the driver told us. I heard that a friend was on top of the Ferris wheel at Buckroe at impact. packed, and quite a number were destroyed. 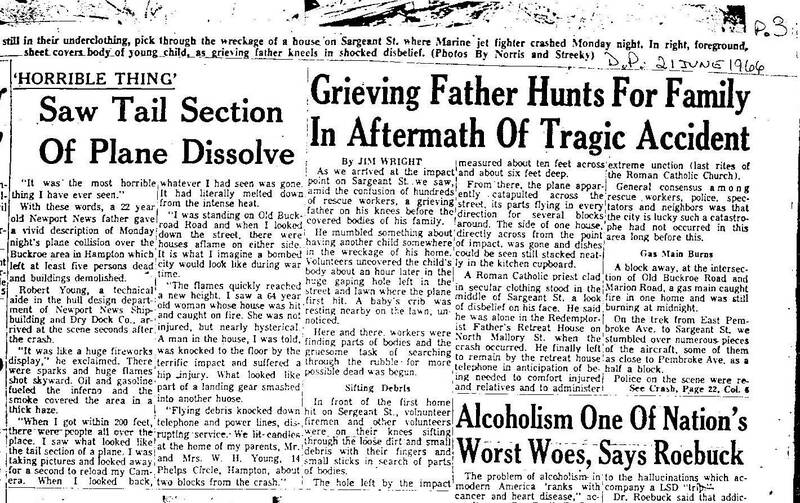 readers have more details on that chilling night in '66. 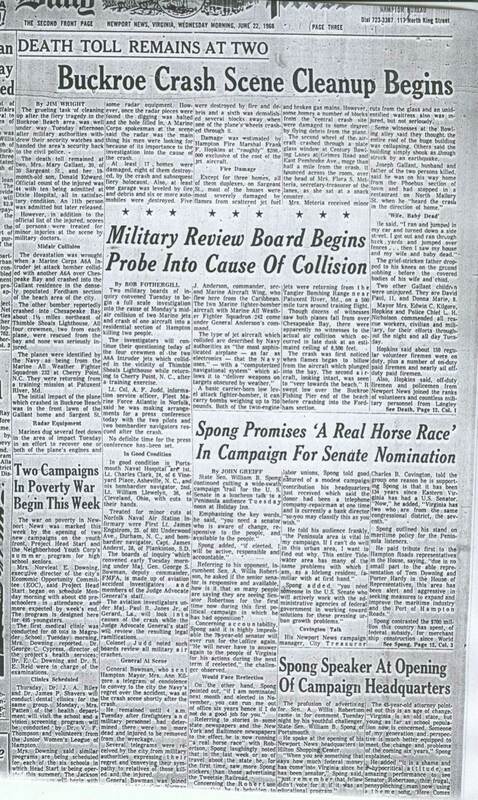 We will begin with Daily Press coverage the morning following the crash, i.e. 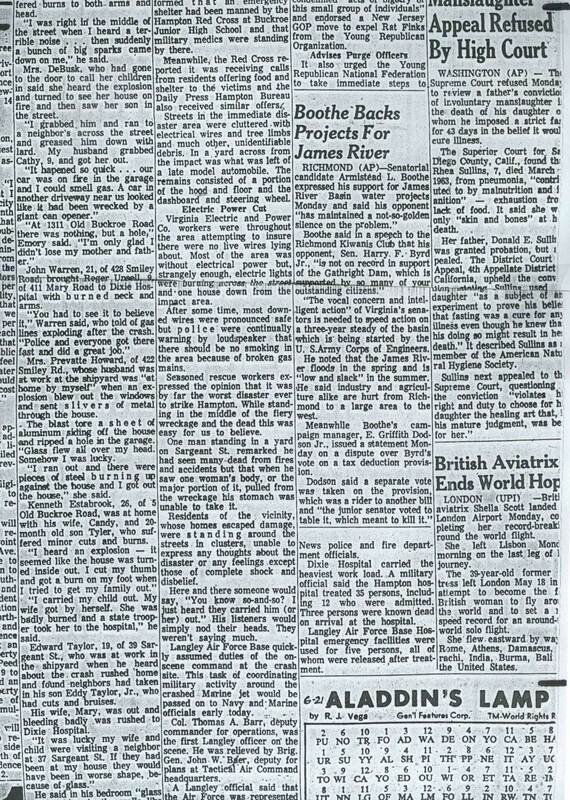 21 June 1966.
will have to simply click successive images to continue reading. Thank you so very much, David! I have no idea how you were able to do all that, but I really appreciate all you did to get these pages - and the facts - for us. 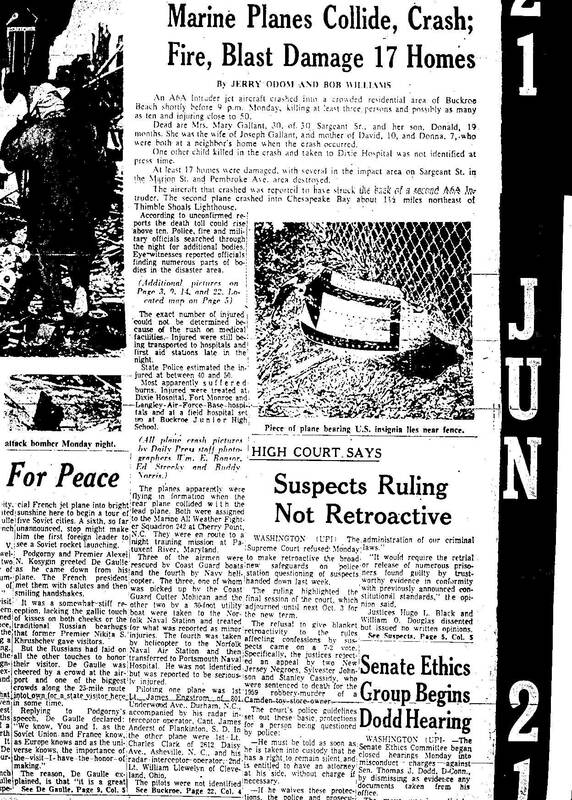 We continue with Daily Press coverage on 22 June 1966. Of interest will be a list of those injured on the page 12 (top) continuation of the article begun on page 3. The DP noted that Page Three is known as the "second front page". 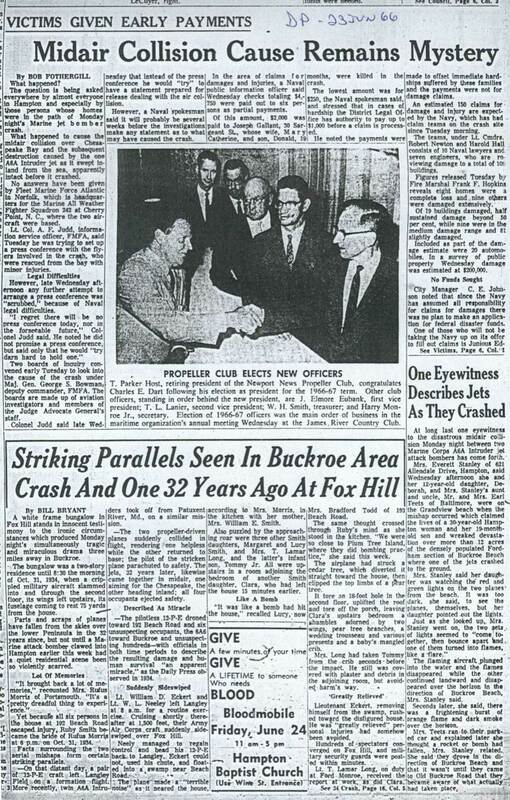 We conclude with Daily Press coverage on 23 June 1966.
deal more research and would likely exceed the interest of most readers. EXCELLENT!!! Thank you again, so very much, David! Most of my research results in fun and nostalgic fodder for the web site. Not this time. I have visited the crash site thrice in the last four days ... taking digital images and trying to work out the direction of the aircraft and the location of the destroyed houses. There is no evidence that there ever was a crash, but that is to be expected 41 years later. Even mangled trees have had sufficient time to re-grow. As I was taking the images, one resident came up and asked what I was doing, perhaps fearing that I was a developer preparing to level the neighborhood for condos. When I explained that there had been a terrible military air crash just across the street in 1966, she said that she had heard about it when she moved there. Clearly, the legend has not completely faded. Despite shivering in shirtsleeves on a cold day, she was very interested in my account of the crash geometry, casualties, and names. 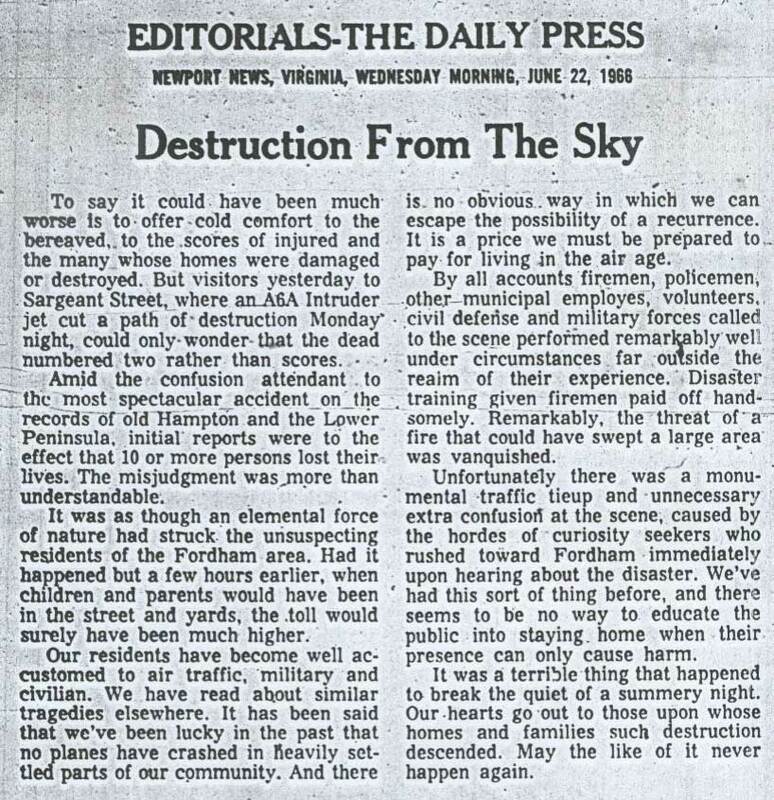 Also, I recently had a look at the Norfolk newspapers for the days following the crash. In some ways, that coverage was easier to understand. 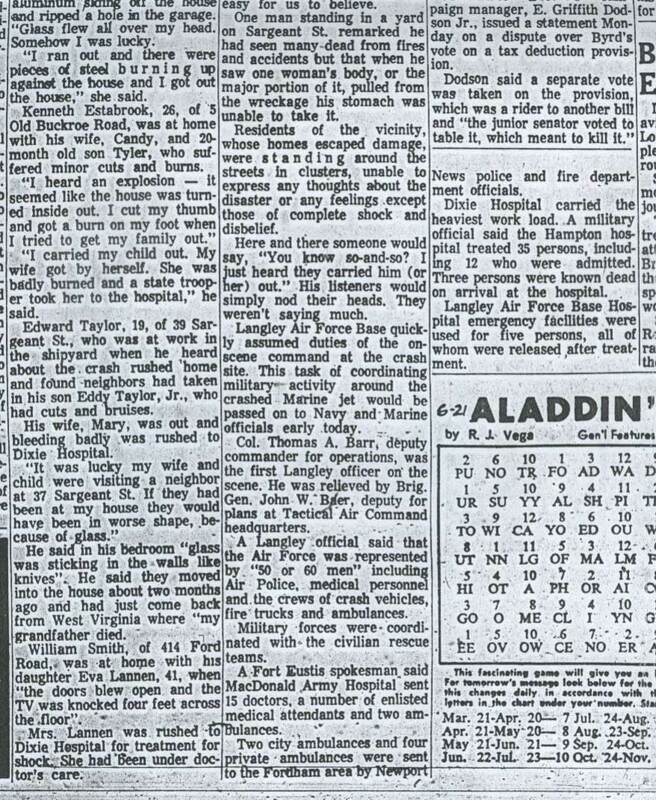 With all the names of the injured in the paper, it would be simple to find some of them still living today. I did find an address for one with little effort. 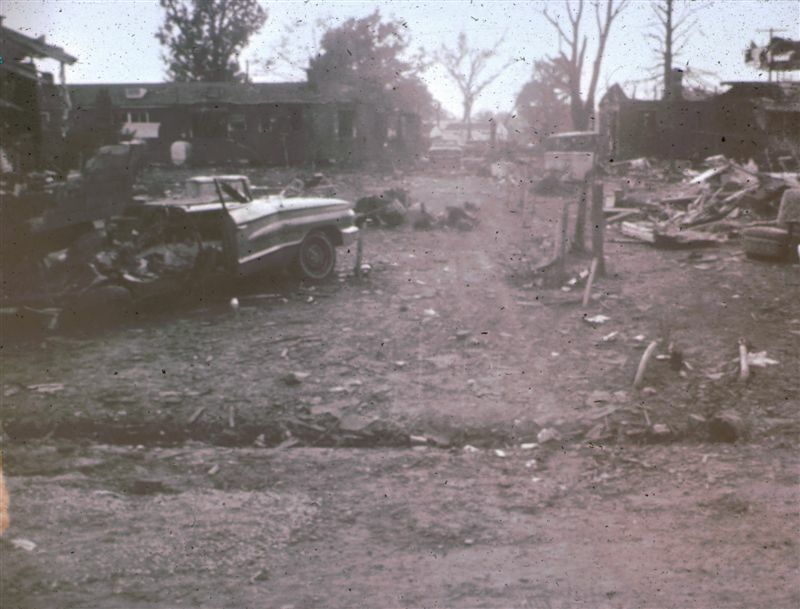 Also, one Sargeant Road resident's name in 2007 is the same as in 1966; that home was very near the path of destruction. I even found a likely address for one of the four Marine pilots. However, I cannot imagine contacting any of them and asking for recollections. That would be cruel and painful; satisfying our current curiosity is simply not worth doing that. So, we must be content with what we can read and see in the photographs. The most distressing thing I read was that rescue operations were seriously hampered by sight seers who clogged roads and loitered in the area on foot, despite orders from civil and military personnel to clear out. In a way, I can understand why some people chose not to remember such an awful event. Perhaps they were terrified by the idea that fiery death can fall on you from the sky at any time. It was a bright and cold day -- perfect for image taking. INCREDIBLE!!! Thanks so much, David! 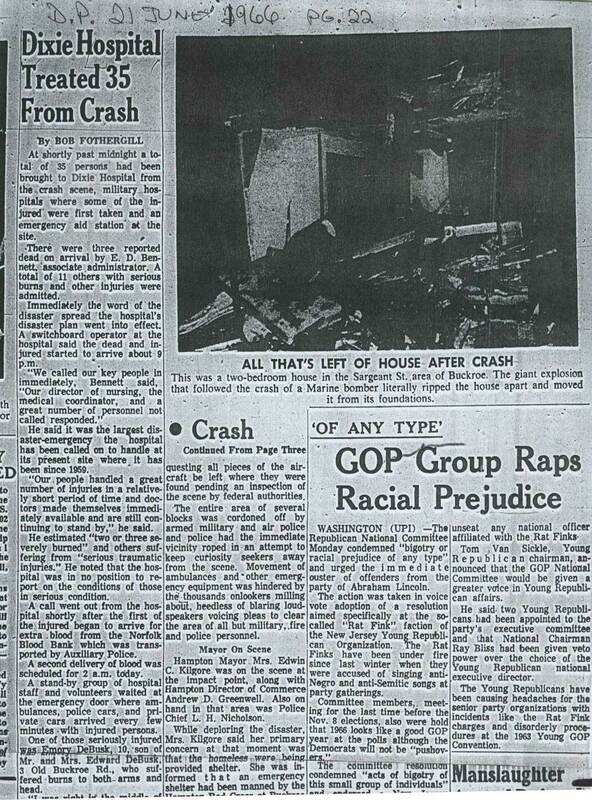 the 1966 crash.... and proving that I didn't just imagine this tragedy. The personal stories were positively hair-raising. And thank YOU, Carol, for making this possible! Certainly, Jean! As tragic as it was, I really appreciated the opportunity to learn all about that. It was one of those things I didn't know I didn't know. Thanks so much for your original inquiry! 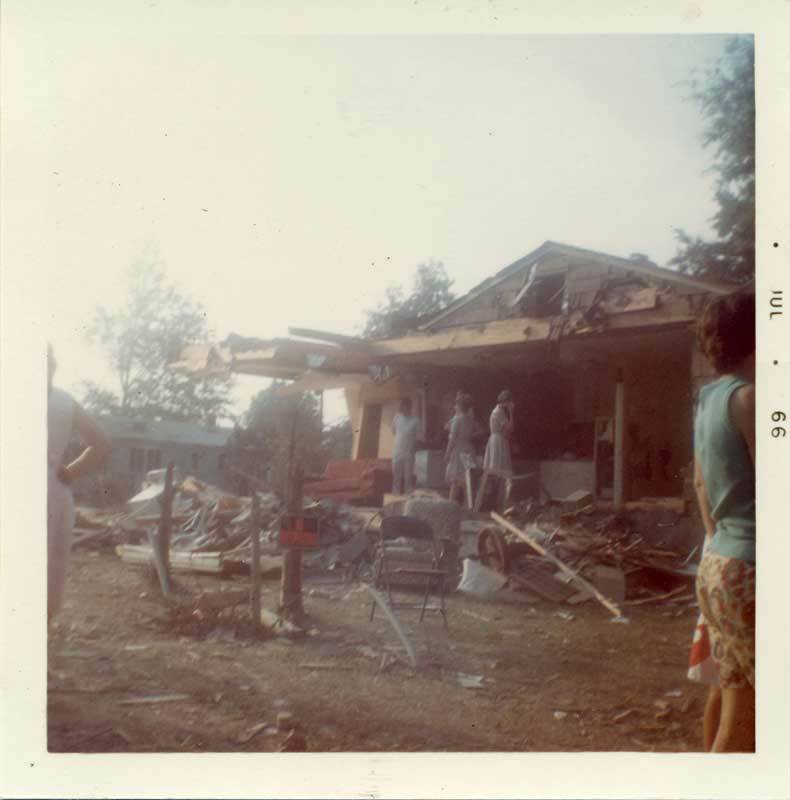 I enjoyed reading the articles and viewing the pictures of the jet crash years ago in Buckroe. I recall it very distinctively even though I was 200 miles away. 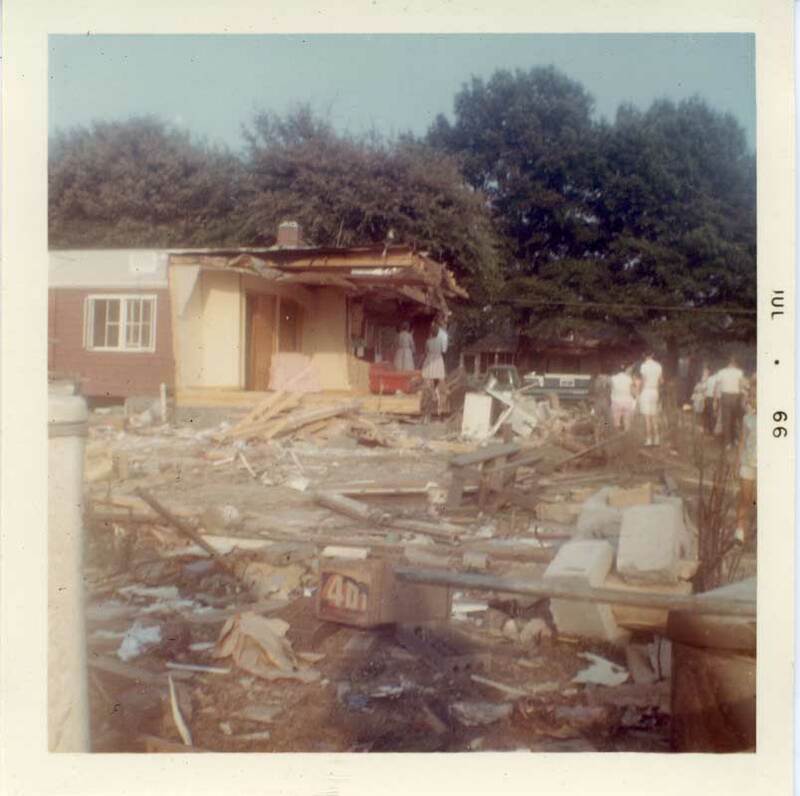 The reason I remember it so well is that my college room mate Tommy Wampler's family lived on Sargeant Street a couple of houses from the plane crash. I remember him and James Cross, whose parents lived down the street, trying to call home to check on the family. This is the kind of event you don't easily forget, especially when you have family and friends who are located close to the area. 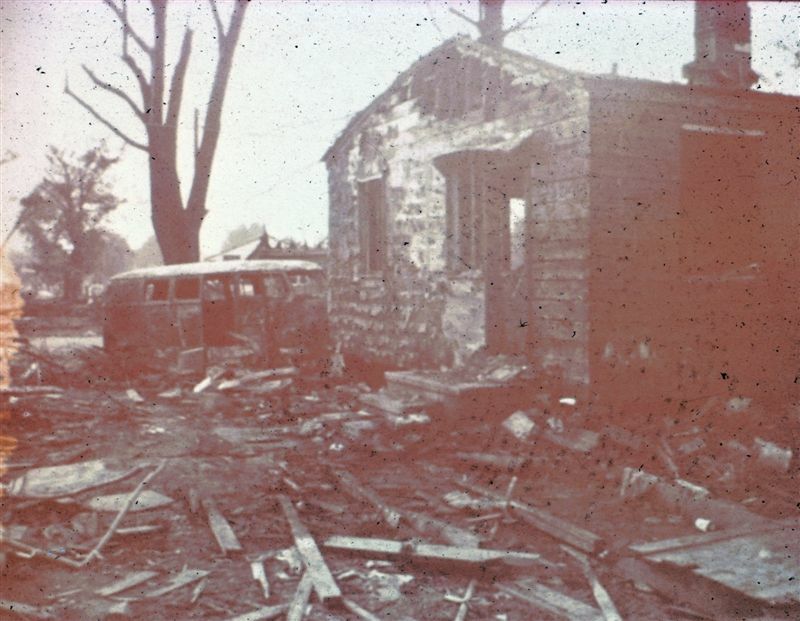 My girlfriend at the time lived on Old Buckroe Road and I was finally able to reach her to find that the plane had crossed Old Buckroe Road a few miles away so she and her family were safe. Definitely some tense moments. Thanks to all who contributed to recalling this event. 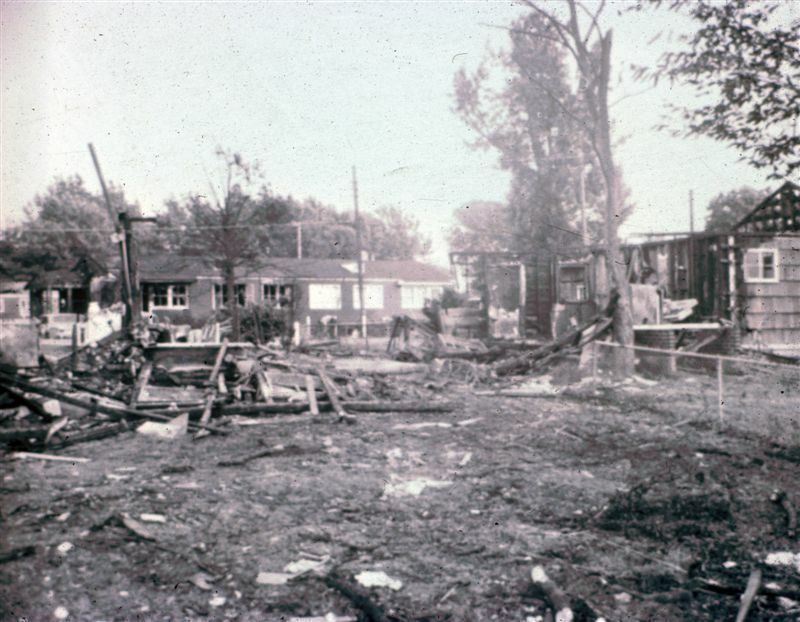 It was sad that the plane had to land in a housing development and take a couple of lives, but I guess when you look at the way it went down between the row of houses you realize how many lives were spared had it not landed where it did. as the flower of grass.